Wisdom of Life. : Discipline coud be judged by cleaniness. Do you know the way you portrait yourself is very important? Your character and personality are almost judged by the way you dress up your entire physical. The better looking you are, the more you are recognised as a true successful person with responsible behaviour. Next could be your working place. If you are a person who is discipline and also responsible, you tend to have a working desk which is tidy and well arranged. Or if you have a chance to visit another friend's home, observe his house environment. His clean garden plus a comfortable interior would tell you that he is a man of discipline again. Take an excuse to visit his toilet. If is in super condition, this family is truly a responsible one. Last Saturday, I visited Singapore which is not too far away from Malaysia. Since my second son has migrated there with his family, I took the opportunity to stay in his apartment. I had a chance to drive a bit around the city, jogged in the nearby park, walked over to the wet market and the surrounding food courts. To my amazement, I noticed there was no littering or throwing of rubbish wherever I went. 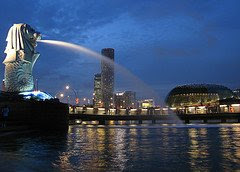 Although Singapore is a little island city with a few million population, it has managed to control the cleaniness of the country to almost perfection. Is definitely not an easy task. I am sure their nation has spend a lot of effort to teach and to educate their people. It relates to me that Singapore is a very discipline country. And that is the main reason which helps them to advance to where they are of today. Congratulation Singapore! Moral of this story - To have a responsible and discipline nation, one has to start from our oneself and family first. Are you? A Chinese Proverb - "A bird does not sing because it has an answer. It sings because it has a song."